Emerging suburban area​s are prone to being dubbed as 'fast growing' due to the smaller population base and availability of developable land. 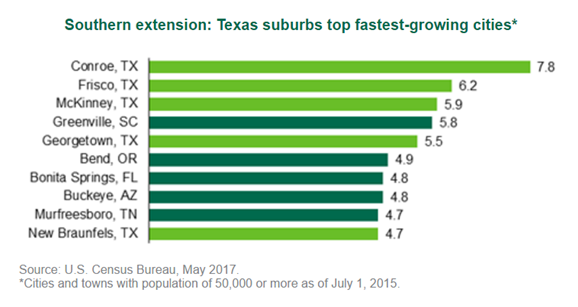 All major metros in the Texas region showed a shift toward more suburbanization (except Tulsa) and became more urban during the 2010-2016 period. The largest cities in Texas made the fast-growth list—San Antonio (3rd), Dallas (6th), Fort Worth (7th), Houston (8th), and Austin (9th)—with numeric population growth ranging from 17,738 to 24,473.